“In the face of death, the Church confidently proclaims that God has created each person for eternal life and that Jesus, the Son of God, by his death and resurrection, has broken the chains of sin and death that bound humanity” (Order of Christian Funerals, #1). The Funeral Rites offer three distinct but cohesive rituals to help those going through through the various stages of grief following the death of a loved one. Gathering in the Presence of the Body: This Rite is a prayer that is often used when the family first gathers in the presence of the body; this may be soon after death or at the funeral home prior to the wake. It provides a good opportunity for the family to prayerfully acknowledge their loved one's passing. Vigil: In this Rite, the whole Christian community keeps watch with the family in prayer and finds strength in the presence of Christ. Usually, it is a Liturgy of the Word, with an opportunity to share stories and favorite memories of the deceased. Liturgy of Christian Burial: This ritual is a liturgical celebration of the Christian community for the deceased. The community gives praise to God for Christ’s victory over sin and death, and commends the deceased to God’s tender mercy. The rite can be celebrated within Mass, or in a simpler manner as a Liturgy of the Word, with final commendation and farewell. 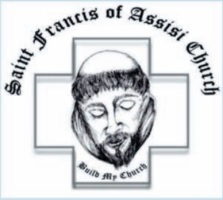 Here at Saint Francis of Assisi Church, we are blessed by the work of our Funeral Mass Preparation Ministry who meet with families soon after the death of a loved one to help them in the planning of the prayers and readings for the Funeral Mass. Families can expect to hear from one of our Funeral Preparation Ministry people within a day after the death of a loved one, as well as our Choir Director to help with the planning of music.